It’s a do-it-yourself world out there and you need to be able to use all the marketing tools available. “No cue sheets, no pay.” That’s the mantra you need to remember when you’re dealing with film/TV music. Sometimes it’s easier said than done. When my friend, topical songwriter Smokey Miles (aka Count Smokula) started to tell me the story of his “Balloon Boy” song and it’s use on TV surrounding that hoax, I though it was something you should hear about. It turned out to be an even more valuable lesson than I thought after he got deeper into his experiences with other TV projects he’d written for and companies he got screwed by. You’ll be glad you listened to this! The Annual Taxi Road Rally is a major event that no songwriter should miss. It’s free for Taxi members + one guest, so if you’re not a member, attach yourself to one and get here to L.A. , usually on the first weekend in November. Details at www.taxi.com. These are my answers to some questions from a client who lives in New York and was attending his first Taxi Road Rally. Q -There might be 2000 people at this event. How do you effectively network with the “players” if you’re tripping over 100 other people to try to get to them? A – Make sure to get there early to sign up for one-on-ones, short 10 minute session with someone of your choice. Those are generally the screeners (obviously all industry pros) so check out the bios of the screeners/A&R staff at the TAXI site and make a list of who you’d like to talk to in the order you want to. There are also many industry pros in addition to the Taxi A&R who participate as mentors. Not guaranteed they’ll all be there or that the hottest sessions won’t fill up before you get there but give it your best shot. Q – At the lunches, who sits at your table and how is that decided? A – Generally, the same screeners/A&R staff and other industry pros. We spend about 15 minutes each at several tables. We’re directed to tables by taxi staff or just directed to find another open table that the previous guest has just left. So there’s no way to plan it. Each table will get about 4-5 guests during the dinner and nobody knows who they’ll be. Teachers of the classes who aren’t Taxi Screeners also do the one-on-ones and tables. Rarely do the industry panelists who are major label people and writers participate in those sessions. Q – How many CDs should I bring/prepare (if any)? How many songs on the CD? A – Consider that you may want to give them to potential collaborators as well as industry people. Know that the odds of an industry person listening to a CD later are slim. They may walk away with 50 or more of those and they already have a stack back at their offices. So the number is up to you. Maybe 25. There’s always a huge pile of CDs left on tables afterwards and they just get tossed. You may want to pick up CDs from potential collaborators, singers, and others you vibe with during the weekend so you don’t want to be stuck taking back too many of your own. Q – Can I mix genres or do I have to have separate CDs for each genre/person I’m pitching to? A – The separation of genres isn’t a bad idea though you can just separate them on your CD and clearly mark them by genre, which will save you cutting new CDs for each genre. Q – Do you bring typed lyric sheets? Q – Do I bring business cards as well? A – DEFINITELY – make sure it has your website/MySpace/Facebook etc. on it where they can hear your songs. E-mail address and phone too. Photo may help people remember you. Be sure that whenever someone gives YOU a card (like that bodacious babe) that you make a quick note on the back of her card. Otherwise, you’ll be amazed how quickly you forget before you transfer the info to your database. Q – Is smiling a prerequisite or can I just look glum the entire time and no one will say anything? A – Definitely no-one will say anything. You’ll be totally friendless – except for me. Do not look depressed, dejected, arrogant or constipated. The mission is to look happy, successful, confident and RELAXED (Remember you’re in LA, not the Big Apple.) There will be a certain amount of tension and confusion on the first day as you get everything sorted out but by the 2nd day, though you’ll still be excited (Let yourself be amazed and thrilled!!) you’ll be more chilled. Smile constantly and be ready to meet everybody. Assume they’re all there to meet YOU! Make sure you have a good 10 second “elevator speech” to introduce yourself. You might want to bring your laptop and a good digital voice recorder that you can take notes on, (You’ll be bombarded with insights you’ll want to remember.) and upload it to your laptop daily. This is “information overload” time so be ready to retrieve it while you can. Good luck, bro. This can be a life-changing experience if you let it. Come visit us at our booth. I’ll also be teaching 2 classes, doing mentor sessions, a mentor lunch and booking private one-on one consulting appointments on an hourly basis, so book me early by e-mailing me at john@johnbraheny.com (Write “Road Rally Consult” in subject line). Note: for more info about the Taxi Road Rally, go to the TAXI forum where you’ll find two great threads (First Rally?) that will provide lots of details about what to expect from and prepare for your first Road Rally. I have found some of the writers of (hit Country group) tunes. Their publishers are listed with ASCAP. Would it be common practice to contact the publisher of that writer in hopes that they could publish and pitch another tune to the band? Good work. You’re on the right track. However, sending the songs to publishers, though not a bad idea on the face of it, just puts you another step from the mark. If you pitch to a publisher it should be the publishing company of the writers in the group. This puts them in a position of being a direct financial participant in the publishing income from their recording and that’s a BIG incentive for them. When it comes from an “outside” publisher the group won’t participate in that income at all. In some cases, ownership of the publishing may make the difference between an album cut and a single (from which they’ll make a lot more performance income). 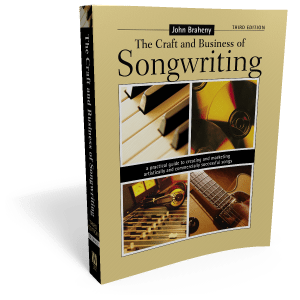 Find more practical info in Johns Book, The Craft and Business of Songwriting. Buy it here! Contests provide songwriters, singers and bands with an opportunity for validation/acknowledgment of their talent as well as an opportunity to win prizes. 1. Find a Music Publisher to represent your songs. If you have no inclination to be on the phones making cold calls and researching recording, TV and film projects and negotiating deals and you have no existing contacts in the industry you’ll want to go this route. If you have internet access, search the data-bases of ascap.com, bmi.com, sesac.com, in the U.S.A. or the performing rights organization in your country . Search for song titles and writers in your style and find out who publishes them. Call for permission to submit your songs. There are also other resources for the names of publishers. Go to your library, find Billboard Magazine, look up songs on the Hot 100, R&B or Country charts in the style of your songs and see the accompanying list of publishers. You may also be able to also get referrals from your performing rights representative if your songs are exceptionally good. 2. Pitch songs directly to recording artists. 3. Have an entertainment attorney submit your tapes. Entertainment attorneys have industry contacts and if they feel your songs merit referral, they’ll shop them for their usual fee (roughly $100-$300 per hour) or may do it on spec. Not all attorneys will shop tapes, however. 4. Submit your songs or music into film, TV, production music libraries or multimedia productions. There are increasing opportunities in these industries for not only songwriters but for composers of instrumental music who have master-quality recordings. Start your research in the phone book and ask the companies if they use original music in their productions. Some will use music from production music libraries or services that supply prerecorded music to film and video productions. Ask them for the names and phone numbers of those whose services they use and follow up to submit your music. If they like what they hear they’ll usually do a contract exclusively for visual use which means you’ll still be free to use it on your own audio recordings. You’ll be paid as the music is used and you’ll also receive royalties through your performing rights organization, after your music appears on television. How much you’ll receive depends on a variety of factors including the terms of your contract. 5. Offer a percent of the income from publishing royalties to anyone associated with the artist. This time-honored sales incentive can work if those contacts aren’t prevented by their employers from participating in that type of transaction. Contacts may include, limo drivers, hairdressers, road managers, touring musicians and crew, recording engineers, relatives. How much? 5-10% of the publishing half of the song’s “mechanical” income (from sales of CDs and tapes). Only offer the percentage of income from that specific recording. Do not offer the percentage of ownership of the copyright, which will last the life of the copyright and include income from other recordings of the song. 6. Produce an artist/band and write for or with them. If you have developed some production skills and have access to a good studio, find an exceptional local group with a great singer or singers and write for them, creating a style with the songs you write for or with them. The Glen Ballard /Alanis Morrisette collaboration is a good example of this strategy. Shop the masters to record companies. 7. Be your own artist, produce your own CD and sell it at your gigs. 8. Find a local group to write with. If you’re a good lyricist, whether or not you can write melodies, find a group with a great lead singer and write with him or her. That way, the singer can infuse the song with an individual style and also be motivated by participation in the writing royalties. 9. Submit songs via a respected service organization. The best one I know is TAXI, an innovative tip-sheet/independent A&R service. Members, world-wide, receive listings every two weeks by major and independent labels, film music supervisors and publishers looking for writers, writer/artists, bands. All submissions are pre-screened and critiqued by industry pros. All styles including instrumentals. Another service worth looking into is SongCatalog.com where, for a fee, you can post your songs online and, by way of entering specific search criteria, potential users can find your song and contact you or your publisher. 10. Attend seminars and meetings of songwriting and music industry organizations. These events and organizations invite record company representatives, music publishers, record producers and managers to speak and screen songs at their meetings. You can meet them and hopefully begin to form ongoing relationships with them and continue to submit songs. This is an updated version of an article that was written for Canadian Musician Magazine. Your demo will introduce you to the eyes and ears of many music industry professionals. Take this introduction very seriously — it’s your job interview. Here is a short checklist that summarizes the biggest mistakes I see new artists make all the time. Avoiding these will maximize your chances of getting heard and respect the demo listener’s time. 1. Sending more than 3 songs (unless specifically requested). Demo listeners like to watch the “In” pile on their desk shrink and the “Out” pile grow as quickly as possible. If the listener has limited time, which is usually the case, the tendency is to listen to a CD they know they can complete. So if you send a 12-song demo or a 12 song master, send a note that prioritizes 3 songs they should listen to. If you refer them to a MySpace, ReverbNation or other page where you have a list of songs, do the same. If you want them to hear a song for a specific artists you think the song is appropriate for, tell them to listen to that specific song. If they like it, they may listen to others. If you’re presenting it via snail mail or in person, they want you to send (or play) them three songs or less that you totally believe in. If you’re not far enough along to be able to decide, you’re not ready. When sending CDs with more than three songs, highlight three you want the listener to focus on first, and include the numbers of the cuts in your cover letter and lyric sheets (so they have a reference while the CD is on their player and they can’t see the label). If they like those, they’ll listen to the others. Send CDs in standard, hard, jewel cases (not soft, thin vinyl) labeled on the spine so when they stack them they can find them later. And please remove the shrink-wrap! 2. Not placing their best and most commercial song first. If you have a strong up-tempo song, start with that. If the listener doesn’t like the first one, it may be the only shot you get. 4. Not sending a lyric sheet, neatly typed or printed. Letterhead is impressive. It says “This is my business and I take it seriously.” Some don’t like to look at lyrics while they listen, but most do. It’s a time saver to be able to see it all at once and to see the structure of the song graphically laid out on the page. If you submit online, attach the lyric sheet so they can look at it. Lead sheets (with melody and lyric together) are not sent out with demos. They’re bulky to mail, it’s too difficult to follow the lyric and visualize the song’s form, and many industry pros don’t read music anyway. If they want to record the song and ask for one, then send them a lead sheet. When you type your lyric sheet, separate the sections of the songs with a space and label each one (verse, chorus, bridge, etc.) at the upper left side of the section or otherwise differentiate them by indenting or bolding the chorus or typing them in capital letters. If you’re repeating a chorus, note where it goes. Do not type your lyrics in prose fashion. Lay them out with the rhymes at the ends of the lines so the structure and rhyme schemes of the song can be seen immediately. Make sure there’s a copyright notice (© 2011 I.B. Cool, All Rights Reserved) on the bottom of the first page of the lyric sheet and on the tape or CD label. Technically, this isn’t necessary but it alerts everyone that your song is protected, whether it’s registered or not. (See the U.S. Copyright Office Website for info and forms.) Note: DO Register your song at the Copyright Office to be on the safe side. Cover letters should be short and to the point. Let the music speak for itself and avoid hype. A professional presentation will do more to impress someone than “I know these are hit songs because they’re better than anything I’ve ever heard on the radio.” Don’t hype, plead, apologize or show any hint of desperation. It only gives the message that you have no confidence in the ability of the songs to stand on their own. It should be addressed to a specific person in the company. It should state your purpose in sending the demo. Are you looking for a publisher, a producer, a record deal for you as an artist? Do you want the listener to pay special attention to your production, your singing, your band, or just the song? Is the song targeted for a specific artist? List any significant professional credits that apply to the purpose of your submission. If you want your song published, list other published or recorded songs, contests won, etc. If you’re a performer submitting an artist demo, resist the temptation to grab at weak credits: “I played at the same club that (famous star) played.” Tell them what drives you, what inspires you. Keep it short. List real sales figures. Don’t lie. Include any casting ideas you might have if you’re pitching to a publisher. Ask for feedback if you want it. Odds are you won’t get it but give it a shot. Thank them for their time and attention. 7. Not putting their name, address and phone number, e-mail address and Web site on the CD, the case, and on every lyric sheet. It seems like such common sense. In fact it would be embarrassing even to suggest that you might forget to do it but I see it happen constantly. The problem on this end is that, between listening sessions at the office, the car, and home, it’s so easy to separate the CD from the case or lyric sheet. Once they’ve gone to the trouble to find your hit song, not finding you is a fate neither of you deserve. 8. Not using adequate postage. You’d be surprised how often this happens. Take the time to weigh your package at the post office and use the proper postage. 9. Sending CDs in ordinary stationery envelopes. It’s risky because rough postal handling could force the edge of the case through the envelope. Use a special envelope with an insulated lining. 10. Sending song fragments or intro clips. Like “a verse and chorus of each song to save their time and give them a taste.” Seems like a good idea if you’ve never been in the listener’s position and really like the verse and chorus, then have to wait until the writer can send you the rest. Frustrating! If I only want to listen to a verse and chorus or less, I’ll just skip to the next song. Send an E-mail with the audio file attached. Follow the suggestions listed above for cover letter (Include phone number(s). Also include your Web site address so they can click it and go directly to it. When they get to your site, they’ll hopefully find additional bio material, photos and lyrics. Just send them an e-mail intriguing enough to get them to go to your site and hear your music there. Indie marketing guru Tim Sweeney suggests that because of the limited amount of time someone may want to spend at any site and the degree of difficulty their online access speeds may present, it’s important to help them decide quickly which of your songs may be of most interest to them. You can help by providing a short description like this one provided on the site of Franklin Spicer and Valerie Ford’s Pegasus Project, a soft jazz, world music group. Note that the description includes information on the style, what it’s about, why it was written and how it was recorded. Their site also includes lyrics to all the songs. Remember, your demo should look good, have something important to say, and say it well. There are a lot of other applicants for the job. The pros are looking for the best. Be the best!